Skip got involved in competitive weightlifting, power lifting and body building at age 18. He competed in and won contests throughout the United States. He is now into his third career as a Personal Trainer, having retired from management positions in the Air Force as a Lt. Col,, and in the aerospace industry. He received his bachelor of science degree from the University of Maryland and a Masters Degree from Central Michigan University. Skip is certified as a personal trainer by the National Strength and Conditioning Association (NSCA). He continued his education with certification as a golf fitness instructor. In 2008 he won the Virginia State Masters Golf Championship. Skips Specialties include body shaping, strength and cardiovascular training, stretching exercises and nutrition. He creates training programs for beginners and experienced weight trainers and for those who want to improve their athletic ability in sports, especially golf. Skip will help you achieve your goals by customizing a program specific to your needs. 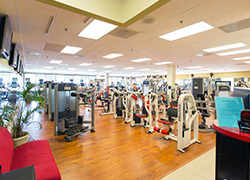 Olympus Gym Purcellville offers state-of- the-art fitness equipment, fitness classes and personal training. Olympus is the most well equipped fitness center in the metropolitan area. We have men's and ladies locker rooms with lockers and showers and one extra private bathroom. All fitness classes are free with gym membership. New members are always welcome. Come try out the gym with a free 1-day pass. Stop by and meet one of our trained sales staff, call us at (540) 751-1050, or email us at olympusgym201@gmail.com. Family friendly! Classes and activity for family members of all ages. Now providing 24*7 gym access! No more excuses not to work out. Our newly refurbished design provies a safe facility with electronic fob key entry and building security entry. Current Member: Having access to a 24*7 fitness facility has helped me to lose 30 pounds in the past 3 months. Thanks Olympus Gym Purcellville. Olympus Gym Purcellville © 2019. All Rights Reserved.